I've never really been a fan of leather (or leatherette) but in the last few years I've really taken a shine to it. My budget can't stretch to real leather but I think I actually prefer leatherette anyway and I definitely have a few items on my wish list for the winter. When Long Tall Sally contacted me to pick a few items from their A/W 2015 range and I spotted some leatherette leggings* I knew I needed to pick them. A look I really like in the winter is a floral dress made warm and cosy by teaming it with a chunky long jumper, thick black tights (and probably socks as well!) and some boots. I'm really not great at styling but this year I thought I might 'toughen up' this look a little with the two Long Tall Sally items I picked. Please excuse the scraped back hair, it was windy and I couldn't be bothered trying to control it! For the first look I decided to swap my usual 300 denier tights for the leatherette leggings. A problem I have with a lot of dresses is that being just under 6ft tall they're often a little on the short side for me, so I need a good pair of tights or leggings underneath to help protect my modesty! This is particularly the case with this dress as it's light fabric that is slightly see-through in the light. I tried the leggings on with just a T-shirt (I know we don't do leggings as trousers but I'd say these were more acceptable!) but I'm not keen on the size of my thighs, so wearing these with a dress or long tunic/top is the way to go. The leggings are so comfy, much more comfy than tights that you have to keep hoisting up, so I can't wait to start wearing them. 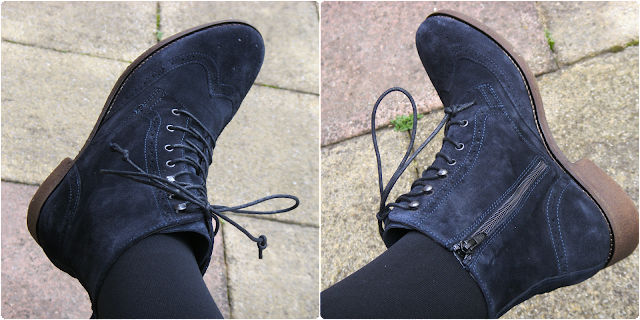 For the second look I swapped back to my thick tights and instead changed my boots for the Taurus suede brogue boots*. How amazing are these boots?! They're navy blue suede with a brogue look that goes up into an ankle boot. I was a little concerned about the laces (I'm lazy) but they actually come with a side zip so you don't have to worry about the laces as they're just for show. I really need to remember to treat these with suede protector before I get caught out in the rain. As I've mentioned before my legs are actually quite short for a tall girl so the leggings are too long for me at 35" but this isn't a problem as I just turn them under at the bottom. I also don't have particularly big feet, depending on the style/retailer I'm between a 6 and 8, but Long Tall Sally shoe sizes go from around a 7 up to size 13. The leatherette leggings are £35 and the Taurus suede brogue boots £120. What do you think of my probably slightly dodgy styling? Perfect outfit for autumn! I love the snuggly cardi and I really like the boots too!